Though It is far from trope-defying and employs an entirely formulaic structure to its scares from start to finish, an engaging cast of protagonists and an unsettlingly sinister clown sets the movie leagues apart from Hollywood’s all-too abundant cheap horror flicks. In 1990, Stephen King’s novel hit television screens for the first time as a miniseries and was defined by Tim Curry’s perturbing performance as Pennywise—a supernatural creature, crafter of horrors, devourer of children and most importantly a dancing clown. 27 years later, it’s Pennywise’s performance once again that brings It to life as a movie, this time played by Bill Skarsgard. It takes place in the small town of Derry, Maine, where nothing ever feels quite right, and follows the aptly-named “Loser’s Club,” a band of middle-school misfits who are made to face off against a terrifying thing that rouses every 27 years to abduct and feast on children. The essence of what made Stephen King’s novel horrifying is that this thing—referred to as both It and Pennywise—spent a better part of the time lurking in the shadows of the reader’s imagination. Andy Muschietti’s jerky adaptation of the novel forgoes this entirely in exchange for placing Pennywise front and center. Once you’re past the admittedly fair jumpscares, it isn’t actually all that terrifying. 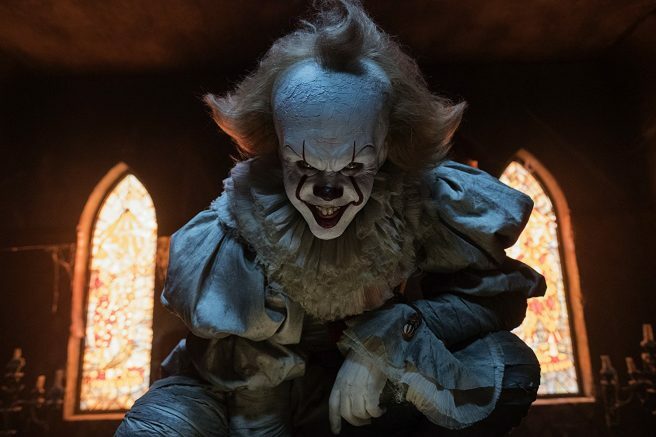 What we do get is the experience of watching Skarsgard bring a new, fantastically vicious Pennywise to life, and a Loser’s Club of talented actors that is impossible not to root for. Bill Denbrough (Jaeden Lieberher) shoulders the burden of dealing with the loss of his younger brother Georgie Denbrough (Jackson Robert Scott), while also having to keep the Loser’s club together to avoid the same fate that befell Georgie. Ben (Jeremy Ray Taylor), Richie (Finn Wolfhard), Eddie (Jack Dylan Grazer) and Stanley (Wyatt Olef) all have their own encounters with Pennywise, and the Loser’s club is all that stands between them and It. The odds are stacked against them until Beverly (Sophia Lillis) enters the picture and brings them together, while Mike (Chosen Jacobs) adds a certain strength to the group. Skarsgard’s performance as Pennywise is sinister and animalistic, and every scene that he’s placed in front of the audience is so engaging that his departure instills a feeling that he’s never quite backed off—that the very next frame, he could spring up once again. Muschietti must have known this. He goes above and beyond to complement the atmosphere Pennywise’s presence creates to make absolutely sure that the audience’s attention is fixated on him, and his use of gyroscoping at points to do so is enrapturing. It’s a completely different interpretation when compared to Tim Curry’s. They’re both outstanding in their own right, but there’s a certain primal quality to Skarsgard’s Pennywise that makes it clear that Derry is a cage of livestock and that he is the predator, up until the very end. If It was to be truly horrifying as a movie, delving into the Loser’s Club’s families and how they’re constantly working to isolate the children would have been a much better way to make it happen. Instead, we have spotlights on fantastic characters, all of whom are brought to life by their actor’s outstanding performances, set apart by repetitive—albeit well-crafted—moments of horror. It won’t have to force fear on audiences or rely on tricks to do so because it has so much more to offer. It most likely isn’t going to be the scariest movie this year, but the odds are strong that it will be the best scary movie. Be the first to comment on "‘It’ brings Pennywise back better than ever"